There is an ongoing debate on the role of corticosteroids in the treatment of chronic subdural hematoma (CSDH). This study aims to evaluate the effectiveness of corticosteroids for the treatment of CSDH compared to surgery. A systematic search was performed in relevant databases up to January 2019 to identify RCTs or observational studies that compared at least two of three treatment modalities: the use of corticosteroids as a monotherapy (C), corticosteroids as an adjunct to surgery (CS), and surgery alone (S). Outcome measures were good neurological outcome, need for reintervention, mortality, and complications. Effect estimates were pooled and presented as relative risk (RR) with 95% confidence interval (95%CI). Of 796 initially identified studies, 7 were included in the meta-analysis. Risk of bias was generally high. There were no differences in good neurological outcome between treatment modalities. The need for reintervention varied between 4 and 58% in C, 4–12% in CS, and 7–26% in S. The need for reintervention was lower in CS compared with C (RR 3.34 [95% CI 1.53–7.29]; p < 0.01) and lower in CS compared with S (RR 0.44 [95% CI 0.27–0.72]; p < 0.01). Mortality varied between 0 and 4% in C, 0–13% in CS, and 0–44% in S. Mortality was lower in CS compared with S (RR 0.39 [95% CI 0.25–0.63]; p < 0.01). There were no differences in complications between treatment modalities. This meta-analysis suggests that the addition of corticosteroids to surgery might be effective in the treatment of CSDH. However, the results must be interpreted with caution in light of the serious risk of bias of the included studies. This study stresses the need for large randomized trials to investigate the use of corticosteroids in the management of CSDH. The online version of this article ( https://doi.org/10.1007/s00701-019-03881-w) contains supplementary material, which is available to authorized users. The authors would like to thank Wichor M. Bramer, information specialist at the Erasmus Medical Centre in Rotterdam, The Netherlands, for his assistance in the literature search. 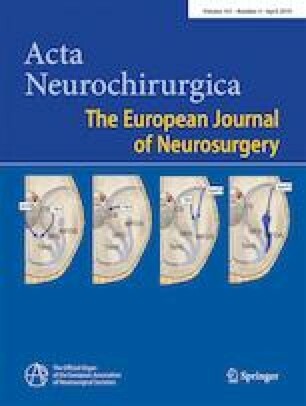 The authors are part of the Dutch Chronic Subdural Hematoma Research group (DSHR); which aims to unite Dutch CSDH-researchers. The Netherlands Organisation for Health Research and Development (ZonMw project number 843002824) provided financial support in the form of funding. The sponsor had no role in the design or conduct of this research. For this type of study formal consent is not required. This article does not contain any studies with human participants performed by any of the authors.